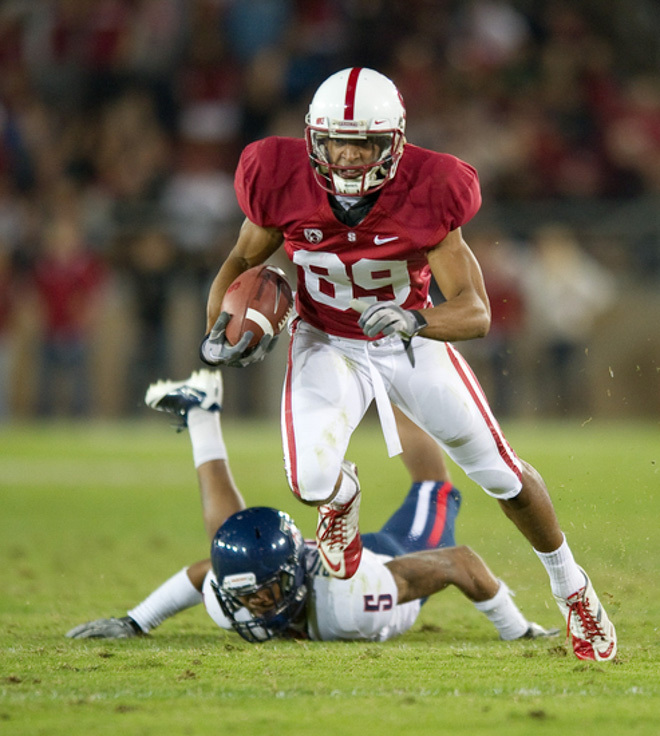 STANFORD, CA - November 6, 2010: Doug Balwin runs with the ball during a 42-17 Stanford win over the University of Arizona, in Stanford, California. Despite Andrew Luck’s ’12 first absence since becoming the starting quarterback in Indianapolis, the Colts still managed to grind out a 16-13 overtime victory over the Jaguars. Tight end Coby Fleener ’12 scored the Colts’ only touchdown and stood out as their most dangerous offensive weapon, racking up 9 receptions for 83 yards. Henry Anderson ’15 turned in a benchmark performance at defensive end, recording 6 tackles and 1 critical deflected pass as Jacksonville pushed for a winning drive in the fourth quarter. After starting 0-2, the Colts are back at .500 and hope to have Luck return for a Thursday night AFC South showdown in Houston. In games that Andrew Luck has started, the Colts are 17-2 against AFC South opponents. The Colts-Texans game is a critical one in the AFC race, as the Colts will face even tougher opposition in coming games against first-rate quarterbacks Drew Brees, Tom Brady and Peyton Manning. Meanwhile, the reeling Jaguars are 1-3 on the season and play similarly-struggling Tampa Bay in what will be a crucial game for both squads, which hope to not fall farther behind in their respective conferences. Heisman runner up Toby Gerhart ’10 will need to re-establish himself in order to help the Jaguars win this battle of the bottom, after he notched just 1 carry for a loss last week. In the two games he has played this season, Gerhart has only had a combined 4 carries. Across the pond in what has become an annual spectacle, London’s Wembley Stadium hosted the New York Jets and Miami Dolphins. The Jets won 27-14 in a convincing fashion and continued their surprisingly superb season. Wide receiver Chris Owusu ’12 recorded 4 receptions for 55 yards, two of which occurred on critical third downs in the second quarter, leading to a Jets touchdown that put them up by two scores. Miami safety Michael Thomas ’12 recorded 3 tackles in a futile effort to contain the Jets’ suddenly potent aerial attack. After a bye week, the Jets return stateside to face the Redskins, while the Dolphins will travel to Tennessee. Eight time zones away, the Seahawks welcomed the Lions to CenturyLink Field for Monday Night Football and won by a final score of 13-10. 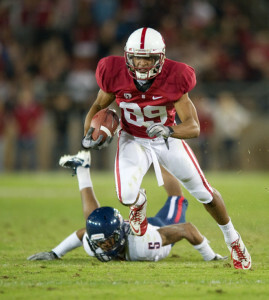 Wide receiver Doug Baldwin ‘11 scored the game’s opening points, with a 24-yard touchdown over the middle. The Seattle defense, aided by the “12th man,” shut down the Lions’ usually high-powered offense, holding them to just a field goal. Richard Sherman ‘11 marked Calvin Johnson most of the night, holding him to just 7 receptions, and also recorded 5 tackles. The Seahawks have a tough test at undefeated Cincinnati next week, while the Lions are home against the Cardinals.